From time to time we are privileged to participate in very special events which mark the changing history of the Jewish people. Such an event was the Service for the Interment of the six Kedoshim at Bushey New Cemetery on January 20th 2019 corresponding to 14 Shevat 5779. With the wonderful co-operation of the Imperial War Museum, where the remains of six victims of the Holocaust had lain in the archives for decades, they were brought to the cemetery and witnessed by an estimated one to two thousand members of the Community and friends, were laid to rest with dignity and heartfelt thoughts. We stood silently and with deep respect as a small coffin containing the ashes and bone fragments of six victims of Auschwitz-Birkenau,and escorted by Holocaust survivors was wheeled into the prayer hall. The gathering included many who had come to pay tribute as well as remember, the Lord Lieutenant representing HM The Queen, Government ministers, MPs, Rabbis and the Catholic Archbishop Vincent Nicholls – to whom we spoke briefly of our times in Birmingham. The service which was held in one packed prayer hall and relayed to a similarly packed second prayer hall and with many standing outside was led by Rabbi Nicky Liss, Chair of the Rabbinical Council of the United Synagogue with support from Dayanim Gelley and Binstock who read the traditional Psalm 16 and a specially prepared elegy for the “Six of our Millions”. The Hazkaraor address given by Chief Rabbi Ephraim Mirvis was listened to in total silence with many showing outwardly their emotions and personal memories. His moving words as he covered the sheer hell of the Shoah, of how grateful we were to those Righteous Gentiles who had made personal sacrifices as well condemnation of those who individually and as nations stood by and did not lift a finger to help. “We were alone” said the Chief Rabbi and referring to the presence of the Israel Ambassador, he spoke of how, never again would there be no place for Jews to find a home with the establishment in 1948 of the State of Israel – perhaps just a few years too late to save so many. He told us that in the small coffin were the remains of five adults and one child. Five adults representing the 5 million adults who had perished and with words trembling with emotion, one child representing the 1 million children whose childhood and future, the entitled joy and hope, had been snatched away by the Nazi killing machine. We did not know the names of those being buried, whether they were male or female, religious or not, how they lived or made a living except for one thing, they were all Jewish. But in that coffin lay the memories of every survivor, perhaps a mother or grandmother, father or grandfather, a sister, brother or a child. There followed the procession, up to two thousand fellow Jews and friends from outside the community, walking as quietly as any gathering of Jews can be, towards the final resting place for the “unknown six”. It was just possible in this huge crowd to hear that daunting thud as the soil fell on this small coffin, shovelled first by survivors. The ceremony ended with the entire gathering joining together with the Chief Rabbi to recite Kaddish. The grave and matevah, memorial stone will be the foundation of a new Holocaust memorial to be built at Bushey. So what of our thoughts as we left this unique event in our history. We reflected on those survivors we know so well in our midst and our respect for their courage and fortitude. We remembered our life-changing participation in last year’s March of the Living and then were jolted into our lives today, most of us in the comfort of a mainly tolerant country which had given a home and hope to our parents and grandparents. We left with the words of the Chief Rabbi ringing in our ears, never ever to forget the price paid by those who had perished, to continue to ensure that the Jewish people lived on and on and to fight anti-Semitism and racism wherever their ugly heads rose and to continue to act and pray for peace in our world. Perhaps the words from the elegy read by Dayan Binstock best capture our feelings and thoughts. “And now remnants of our ashes have come to us, six out of the millions of our holy ones. Whose ashes are they ? From where have you come ? After seventy years you have come to rest – perhaps your place can begin to comfort us…….. Remove wickedness from our world and plant peace in all our places”. Sir Bernard has been appointed Non Executive Chairman of Klapton Insurance whose main activity of insurance and re-insurance is in the African, Middle Eastern and Asian markets. Klapton was recently awarded Investment Grade rating by Bloomfield. 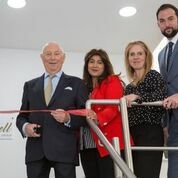 Sir Bernard opened the new offices or the Jarrell Group in Church Street Birmingham. The company founded by entrepreneur Richard Sobol presents exciting opportunities in the provision of people, the most precious of a company’s assets. Sir Bernard Zissman took part in the March of the Living for the first time this year, while in his 80s, and felt ‘totally helpless’ as he witnessed the mass graves in front of him. This is a personal reflection of a “never to be forgotten” experience of four days in Poland in April 2018. That is when we joined 270 others from the UK to see, hear and remember the horror of the Holocaust. Our party was a party of 11,000 Jews and non-Jews who marched from Auschwitz to Birkenau to show that, however evil the Nazis were, Jewish life continues through the hopes and enthusiasm of a new generation of Jews determined not to forget, but to remember and continue to build a future. So what did I feel? Why had I not done this trip before? Why wait until now? I have followed the example of my own grandchildren who have made this pilgrimage. But what were my thoughts as someone who had lived as a child through the Second World War, been rushed into the air raid shelter every night and evacuated from the bombing in my home of Birmingham. Why did I know so little? My first thoughts were: why did I know so little in 1945 of the horrors that had struck the Jews of Europe? We had seen news pictures on Pathe News and Movietone in the cinema and images in the newspapers of the liberation of the camps, the unbelievable scenes of skeletal human beings and the discovery of the mass graves. This was a time of little or no television in the home. And then nothing! There were no further pictures, very few, if any reports, no debate, no discussion. Through my teens I cannot recall any obvious reporting of a tragedy which had claimed six million Jewish lives and the lives of millions of others, until until the reporting of the Nuremberg trials. Why was there so much silence I now ask? The obvious answer is that the images and pictures were too horrific, too awful for us to see and take in. We would be too shocked, and some might not even believe what had happened. The other explanation was the onset of the Cold War and the feeling that West Germany, a key ally in the “conflict” with the Communist Soviet Union, should not be upset. And then there were the survivors themselves.Too scarred and damaged to even speak, many for 50 years, of their own terrifying experience and unbelievable loss, even to their own children and grandchildren, family and friends. Thank God they found the courage to share with us what happened, thank God they found the strength to tell us of this terrible act of evil and tyranny before it was too late and thank God we and the world, or some of the world, listened and have been given the opportunity and yes, the responsibility to continue to uphold the Jewish traditions and way of life for which the survivors’ parents, brothers and sisters, children and extended family all died. I spent every minute during my visit to Poland and since, thinking of what I feel or indeed should feel. There is not a single feeling. I felt intrusive of the deeply personal loss of each survivor, and an intruder in so much private grief. I thought of my own grandparents and great-grandparents who had fled Poland and Russia in time and protected me and my children and grand-children from such a horror. At every Yizkor (memorial) prayer we recite in Synagogue on festivals we remember the six million. Numbers can by themselves mean so much or so little. We can be overcome by repeating how many died, millions here, hundreds of thousands there, 90 per cent of the 3,500,00 Jews in Poland, another 90 per cent in Austria, Germany and the Baltic Countries, over 50 per cent of the Jews in Yugoslavia, Belgium, Hungary, Holland, Greece, Slovakia and the list goes on and on. And similarly only one from Finland out of 2,000 Jews living there. For each survivor the impact is their own one or two, or ten, or all of their family. I simply cannot get my mind around the numbers, I cannot imagine the scale of killing and utterly inhuman tragedy. I cannot find the words. And all this perpetrated by a nation of such intelligence and cultural history, a country which gave us Beethoven, Bach, Thomas Mann, Goethe and Felix Mendelssohn who will surely outlive other German names – Hitler, Himmler and Eichmann. This was not a people of uncivilised tribal savages but a nation who were proud to “get it right” and probably surpassed every other country in their organised crime and tyranny. We stood in the centre of Birkenau and listened in awe and deeply respectful silence to “our own” survivor, Ivor Perl, accompanied by his daughter and grand-daughter. Each of the seven buses had its own survivor, to tell his or her story. I know we have heard the testimonies on TV and even in gatherings back home, but we listened and watched as Ivor recounted his experience by the side of a wagon similar to one in which he travelled as a 12-year-old boy, where he watched an SS guard nod his head or click his fingers or merely point his finger to decide who would live and who would die. We were privileged to have Clive Lawton as our Educator and he explained in graphic detail that we should not confuse the death camps, of which there were only six, with the concentration or labour camps, the former designed by the Nazis primarily to exterminate Jews and others and the latter where those who died did so from hunger, disease, over-work and being shot for being too slow, too old, too young or too infirm. We visited Madjanek and Belzec where we stood many in tears and recited the Memorial Prayer El Malei Rachamim and the Mourners’ Kaddish remembering the families of those in our group. Although we were not alone as visitors, these sites were places of personal quietude, little natural habitation, no shrill of birds, just a silence, a place of unbelievable death, of the memorials so erected and maintained with such care by a Polish people who themselves had been decimated with huge loss of life murdered by the Nazi cruel machine. To be told, and to witness the sight of mass graves of children, “our” children, torn from the grasping hands of utterly distraught parents, some shot and thrown into a heaped grave, some still alive. cannot be absorbed by the human mind. I felt totally helpless and even a sense of shame that I had known so little. As it is said “ the more I learn shows how little I knew “. We came together to mark the Shoah and heard from the inspiration behind the UK March of the Living, Scott Saunders, Chairman of MOTL UK. With huge emotion and gratitude we applauded the presence of Ian Austin MP together with Sir Eric Pickles (former UK Government Minister, former Chairman of the Conservative Friends of Israel and the United Kingdom Special Envoy for post-Holocaust issues) and Joan Ryan MP (Chairman of the Labour Friends of Israel) both of whom spoke movingly and courageously as true friends of the Jewish Community. Our visit ended on a note of hope. We had stood by the memorial at Madjanek and joined young Israelis as we sang together the Hatikvah, the anthem of hope, and stood as one people, the young, the old, those who had survived, those who had been spared the horror, those who were deeply religious, and those who were not. And that hope was the core of the March of the Living, 11,000 marchers from the four quarters of the world in the midst of a sea of Israeli flags walking many in silence some with strong voices. The pledge by Jew and non Jew alike to ensure the Jewish people who paid such a heavy price will continue as a living beacon, not just of the pain of the past but a force for future hope and good. The impressive closing ceremony held in the shadows of the crumbled gas chambers at Birkenau and under a clear blue sky was addressed by the President of the State of Israel Reuven Rivlin and Polish President Andrzej Duda. All those present rose to the strong voice of Lt Col Abramson with the IDF choir as he recited El Malei Rachamim. And we then departed with our own thoughts and memories. I cannot ignore the experience of the day before we left the UK for Poland when we stood in Victoria in London protesting with hundreds of others against those who continue to perpetuate the lies that the Holocaust never existed and who wish to continue the evils of antisemitism, a shame on them all. When will they learn that they can burn our synagogues, even burn our scrolls of the Torah as well as our families, but they will never burn our resolve and our faith to live on as a Jewish nation? To be a part of this visit to Poland has been for my wife Cynthia and myself a unique experience. Perhaps we waited too long to make it, but we have achieved it and we will be inspired by the words of the educators, the commitment of UJIA, our bus organiser and MOTL UK and of course the courage and strength of the survivors. Israeli Ambassador Mark Regev visited Birmingham and during a hectic day met with the Lord Mayor and City Councillors, visited the Pro Vice Chancellor of University of Birmingham and Jewish students. 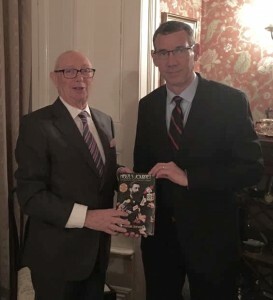 The Ambassador also met with Faith Leaders and addressed the Jewish Community at a meeting chaired by Representative Council President Sir Bernard Zissman, who presented the Ambassador with a copy of his book “Herzl’s Journey”.